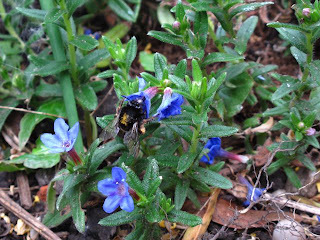 Female A. plumipes feeding on Lithodora. She has got a mark of yellow pollen on her back, probably from the nearby broom. I realised a couple of days ago that I hadn't seen A. plumipes for a few days. Oh no! it's not possible spring is over! I thought. Yesterday I saw a male and a female and today a couple of females so, no, they are still around. I have a few notes about them I gathered these last few weeks. I put together a phenology graph. This includes just my records for this year in Hull. It illustrates the early male appearance and the segregation of male and female observations. 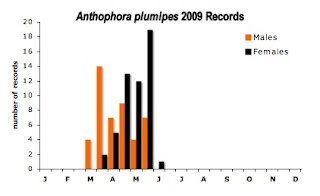 In previous years, my earliest male record was the 10th of March 2007. The earliest female on the 21st of March of the same year. They are around for less than three months. Male A. plumipes at the end of May. It has lost most of his hair and is barely recognisable. I have also compiled the flowers visited by this bee in and around my garden. 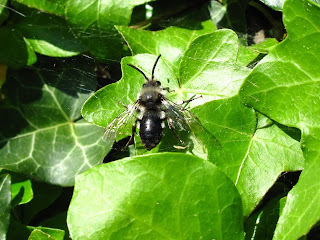 In March, the bees visited almost exclusively three plant species: Grape Hyacinth, Rosemary and Pulmonaria. Their emergence appears beautifully matched to the start of flowering of these species. At the end of April, the bees visit at least 11 plant species. 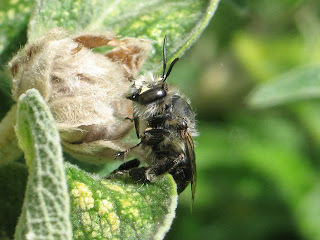 To end, I managed to get a few photos of Anthophora plumipes' cuckoo bee, Melecta albifrons. It visited my garden a couple of days of early may and fed on lilac blossom.